The VIVAREA range provides a variety of interesting and stimulating play activities for children aged 3 to 8 years, in a style that captures the sunny southern European climate. The structures take their inspiration from Mediterranean villages nestled into the mountains, with varied levels, spaces, shapes and heights. Semi-circular terraces, narrow or straight walkways, clever variations in platform levels, closed or open playhouses; the equipment can be used by large numbers of children, providing them with a large number of activities to enhance learning and motor skills. The lowest walkways are only 60cm from the ground in order to ensure easy access for very young children, who can then climb up to platforms at a maximum height of 1.37m and equipped with solid barriers. Older children can clamber up the nets, walls, poles or ladders, to test and develop their physical abilities. The materials are selected on the basis of their mechanical and functional qualities. 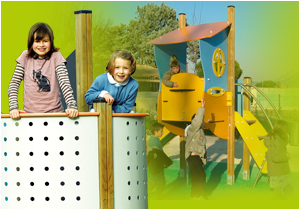 The equipment range comes in a variety of combinations, with key opportunities for play and development, providing suitable options for small or larger play areas alike.